Retail electricity provider, Source Power & Gas has been acquired by an Australian electricity retail specialist, ERM Power Limited. ERM Power, the fourth largest electricity retailer in Australia, has built a highly successful retailing business based on a differentiated service model incorporating superior customer service and proprietary IT systems. 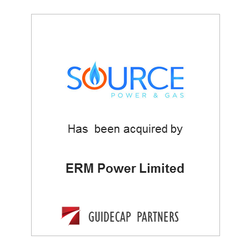 The Source acquisition will serve as a platform for ERM Power’s expansion in the US. GuideCap Partners served as financial advisor to Source Power & Gas.